EU has called on Iran "to respect their international human rights commitments"
TEHRAN, Iran (CNN) -- A group attacked the Tehran home and office of Nobel peace laureate Shirin Ebadi, trampling a sign in the front yard, spray-painting slogans on her building and accusing her of supporting Israel, she told CNN. Shirin Ebadi won the Nobel Peace Prize in 2003 for her human rights work. Police dispersed the protesters, who identified themselves as medical students, about a half-hour after they arrived Thursday, she said. The protesters chanted, "Ebadi supports Israel's murders," according to a statement from Ebadi's Center for the Defenders of Human Rights. "Ironically, the chanting of the slogan comes shortly after the Center for the Defenders of Human Rights issued a statement condemning the violence in Gaza and demanding quick action by international organizations," the organization said. In Iran, protesters are required to get a permit from the local city office, Ebadi said through her spokeswoman in the United States. "I want to know why two policemen stood by allowing the group to carry out attacks toward my home while chanting death threats without a permit," she said in the release. Ebadi continued: "And if they were given a permit, I want to know who had issued it to them." In her own comments, the spokeswoman, Pantea Beigi, added: "Those who know the work of Dr. Ebadi know that she has always been an avid supporter of Palestine and will continue to be so. "Dr. Ebadi just released a statement condemning the actions of Israel toward Gaza two days ago. (Thursday's) events were yet another attempt by the Iranian government to silence the voice of Dr. Ebadi and put a stop to her work defending human rights in Iran." Government agents raided Ebadi's law office, which is in the same building as her apartment, on Monday, seizing two computers and dozens of files and documents on her clients, who are mostly political activists, Ebadi told CNN. 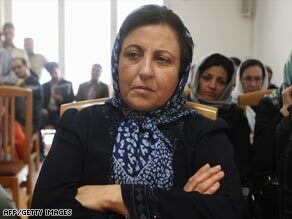 The authorities said they were from the tax office, Ebadi said. Her offices were shut down last week after police raided her office, as guests arrived for a belated celebration of the 60th anniversary of U.N. Human Rights Day. Iranian authorities said the Center for the Defenders of Human Rights did not have a permit for the gathering. That sparked condemnation by the European Union, which called on Iran "to respect their international human rights commitments and the right to peaceful assembly." Ebadi, a former judge and veteran human rights activist, won the Nobel Peace Prize in 2003. She has led several high-profile campaigns on behalf of women and children in Iran and successfully campaigned to reveal those responsible for a 1999 attack on Tehran University students that left several dead. She has been imprisoned by Iranian authorities on numerous occasions. Other peace prize winners have launched a letter-writing campaign to the United Nations and to Iranian embassies around the world in an effort to raise concerns about her safety.